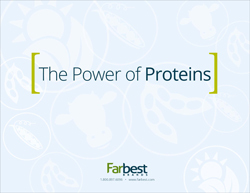 At Farbest, we source only the highest quality protein ingredients. And, with over 60 years of industry experience, we have the expertise to help you combine our top of the line proteins to optimize health benefits, flavor, and savings. Our dairy proteins are rBST-free and come in several different processes to suit all your formulation needs. Even better, many of them come from grass-fed sources. Our plant proteins are Non-GMO Project Verified, vegan, gluten-free, and have Kosher and Halal certifications. Conventional and USDA-certified organic versions are both available. Are you ready to blend your proteins into great tasting, nutritious food and beverage products? Let’s get started!